Princess Cruises’ new Royal Princess will call Port Everglades her U.S. winter home when she arrives in the fall of 2013 after debuting in Europe. Royal Princess will be berthed at Cruise Terminal 2, which was completely renovated this fall to allow for a seamless “curbside-to-ship” guest experience with expanded check-in and baggage claim areas, covered walkways, streamlined transportation routing and bright interiors. The new 141,000 -ton, 3,600-passenger Royal Princess will debut in June 2013, the first of two new-generation ships for Princess currently being built by Italy’s Fincantieri shipyard. The ship’s prototype design will be an evolution of Princess’ classic style, while including some new features and expanded signature spaces. Among the new features found on board will be a 50 percent larger atrium which is the social hub of the ship; a dramatic over-water SeaWalk, a top-deck glass-bottomed walkway extending more than 28 feet beyond the edge of the vessel; plush private poolside cabanas that appear to be floating on the water; a dazzling water and light show; the new Princess Live! television studio; a dedicated pastry shop; more dining options including a special Chef’s Table Lumiere, a private space that surrounds diners in a curtain of light; and balconies on all outside staterooms. Royal Princess’ inaugural cruise will depart from Southampton on June 16, 2013, followed by seasons of cruising in the Mediterranean and the Eastern Caribbean. A sister ship, Regal Princess, will debut in 2014. 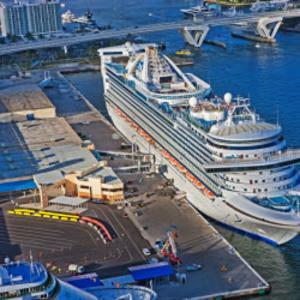 Port Everglades is one of the busiest cruise ports in the world with more than 3.6 million passengers expected during 2013 and more homeported cruise ships than any cruise port worldwide. Twelve cruise lines and 42 cruise ships sail from the South Florida seaport including: Balearia’s Bahamas Express, Carnival Cruise Lines, Celebrity Cruises, Cunard Line, Hapag-Lloyd Cruises, Holland America Line, MSC Cruises, P&O Cruises, Princess Cruises, Royal Caribbean International, Silversea Cruises and Seabourn. The Port&apos;s wide-ranging fleet of cruise ships provides guests with an array of cruise vacation choices from the sunny Greater Fort Lauderdale area. Port Everglades, where the best cruise ships launch and the greatest getaways begin. Details on the latest cruise offerings are available on the Internet at porteverglades.net.